The information below is a listing of frequently asked questions regarding the use of the MCMUA transfer stations for disposing of waste. Infrequent User: If you use the transfer stations less than 3 times per year you can pay for your disposal each time by check as you weigh out at the outbound transfer station scale. The check must be accompanied by two forms of identification. The transfer stations do not take cash and they do not take credit cards. Frequent User: If you are a frequent user of the transfer stations, more than 3 trips per year, you must open up an account with the MCMUA, deposit money in the account and maintain the required minimum balance. The minimum balance will be established individually for each account and will be an estimate of the cost of two (2) average days of disposal. Once your account balance falls below the required minimum balance you will be denied access to the transfer stations until additional funds are deposited into your account. It is therefore suggested that you plan to maintain balances significantly above the minimum to prevent a disruption in service. Account payments must be made by check and mailed or delivered to the MCMUA's administrative office. The address is listed at the bottom of the page. Virtually all types of trucks can be used to transport waste to and dump waste at the transfer stations but most trucks will be required to have an NJDEP decal on them to access the transfer station. The only exception to having an NJDEP decal on your truck is if you are delivering your own waste self-generated in your home and the vehicle registered with DMV as having a gross vehicle weight of 9,000 lbs. or less and the vehicle does not have commercial plates on it. Important, do not rent, borrow or use a truck that weighs more than 9,000 lbs. or has commercial plates on it to deliver waste unless it has an appropriate NJDEP decal on it. Any truck over 9,000 gross vehicle weight or that has commercial plates on it will not be permitted to dump its load at the transfer station if it does not have the appropriate decal on it. 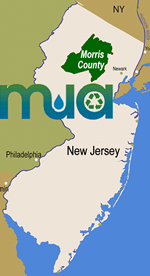 Click here for more information about NJDEP decal requirements or call the NJDEP directly at 609-292-7081. Q. Can very large or long items be disposed of at the transfer stations? Waste accepted at the transfer stations is picked up by large front-end loaders and deposited in large 100-cubic yard transfer trailers for transport to a landfill for disposal. Items longer than four feet (4") in length get stuck in the transfer trailers and will not be accepted for disposal if these items cannot be broken apart by the large front-end loaders used at the transfer station. Large items that cannot be broken apart by the front-end loaders include, but are not limited to, railroad ties, telephone, poles, metal bars, rigid plastic piping, etc. In order to accept these items, they must first be cut into lengths no longer than 4" in length. Large items such as furniture and/or boats and travel trailers (no fluids or batteries) can usually be broken by the front-end loaders and can be accepted as whole units.